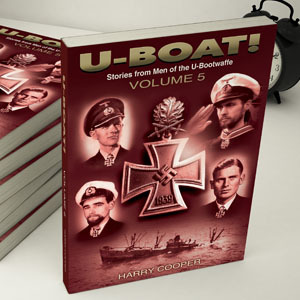 “U-BOAT!” (Volume V) continues the fascinating saga of the German U-Bootfahrer in World War Two plus some stories from the American side. These stories come directly from the memories and video interviews with the men who were there and there is no substitute for first-person memories……and this book has plenty of those. Chapter 1, ‘USS BLOCK ISLAND and her Prisoners from U-66′ – A US Navy report from Commander Task Group 21.11 on how the Task Group found and sank U-66, then how the survivors were picked up. The action between U-66 and USS BUCKLEY was the basis for the movie ‘The Enemy Below’. This chapter goes into the questioning of the prisoners and lightly on what was learned from them. Chapter 2, ‘The Diary of U-764; Fact or Fiction?’ – This chapter is sub-titled “The Story of a Coward and a Traitor”. 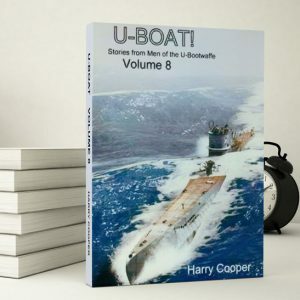 A book of this title was released perhaps twenty years ago and it caused a great deal of controversy because the author, a crewman of U-764, accused the Skipper and other officers of serious crimes. As it turned out from interviews with the Skipper and many of the crew, it was determined that the book was, in the words of the crew, the ‘late revenge of a man who did not fit in with the crew’. He was roundly denounced by his shipmates and this chapter goes into detail about the man and his accusations. Chapter 3, ‘The Death of U-654′ – From the memories of the 40th Bomb Group Association we read of the attack by a B-18 bomber on U-654 and the chapter goes into the maneuvers of finding and attacking the boat; and the ultimate result that the boat with the loss of all hands. Chapter 4, ‘SS BENJAMIN BOURNE‘ – This chapter contains wartime memories of George Ritz as told by his son DON RITZ (4377-1995). George was an engineer on this Liberty Ship during cruises to the Caribbean and Central America. He talks about having no escorts at sea and of U.S. Army guards at the gangplank in foreign ports to make sure no one jumped ship. George talks about convoy action and watching ship after ship blow up around his ship and wondering if his ship would be next. Chapter 5, ‘Capture of HMS SEAL‘ – Did you know that this Royal Navy submarine surrendered to a pair of German aircraft? Or that one of the German seaplanes landed by the submarine and took the British Skipper aboard the plane as a prisoner? This chapter goes into the details of how HMS SEAL was incapacitated, how the airplanes effected her surrender and capture of the Skipper. This is a little known but very important piece of U-Boat history. Chapter 6, ‘the Battle of Bowmanville‘ – A great piece of first-person memories of the war covering the prisoner uprising at this Canadian P.O.W. camp led by OTTO KRETSCHMER (122-1985). The author of this piece, VOLKMAR KÖNIG (5428-1997) was a Fähnrich (midshipman cadet) aboard U-99 on her last Feindfahrt (war patrol). What caused this uprising? Did OTTO KRETSCHMER (122-1985) really crack a Canadian Captain across the nose with a catsup bottle in the melee? Did KÖNIG get shot by a sentry? It’s all in this chapter. Chapter 7, ‘U-960 in September 1943‘ – In this chapter, Oberleutnant zur See GÜNTHER HEINRICH (1945-1991) tells of the time he was ordered to take his boat into the Soviet Union’s Arctic Sea to lay mines. This was a terrible place to operate and “HEINI” tells us why – how they were almost caught surfaced several times and once stuck in the mud while patrol craft looked for them. 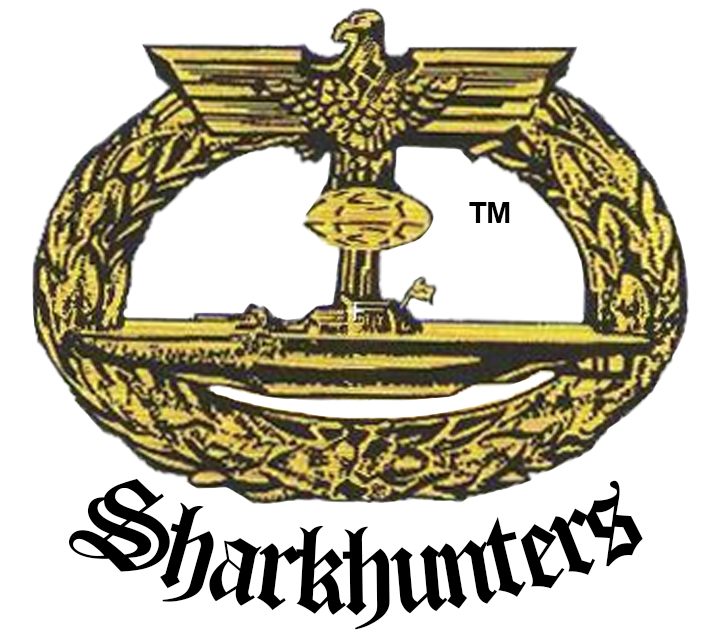 Why were there two Luftwaffe specialists aboard U-960? It’s all here in this chapter by the Skipper of U-960. Chapter 8, ‘HELMUT WITTE‘ – The story of HELMUT WITTE 4238-1995) told by a Rear Admiral of the Navy of Chile. The Admiral goes into the time he arranged a meeting between WITTE and a Skipper of a ship he sank. Chapter 9, ‘JÜRGEN OESTEN‘ – We interviewed KK OESTEN (1681-1990) and he gave us insights into his career available nowhere else including his time at the Academy, the three boats he commanded as well as his finding the location for the 9th U-Bootflottille at Brest and his time directing anti-convoy actions against the convoys to Russia. He talks about attack tactics and evasion tactics as well. In his words, you are the hunter but in an instant, you can become the hunted. Chapter 10, ‘Jacobson in the Merchant Marine‘ – ART JACOBSON (2154-A/LIFE-1992) tells of his father’s time in the war bringing supplies to ports around the world such as Durban, South Africa as well as through the Red Sea. An old sea captain just died on his ship – what were they to do with him? He talks of the dance halls he encountered in exotic ports. Being in the shower aboard a ship when a torpedo hits is not a good place to be, and this is in the chapter as well. They were far out to sea and in lifeboats – what happened to all the boats and men? It is in this chapter. Chapter 11, ‘Günther Grasser‘ – This is the story of the Chief Engineer of U-559 and U-537 as told by researcher RICHARD TROSTEM (5414-2006). This traces Grasser’s early training, service aboard the cruisers EMDEN and KÖLN before cross-training for U-Boats. Then we go into the several Fiendfahrten (war patrols) of U-559 and we live the weather, the convoy actions, evading destroyers – we live aboard U-559. We carefully transit Gibraltar in the face of the Royal Navy presence there and operate in the Mediterranean off Greece and Salamis. It is also the story of a Skipper who was less than excellent. This chapter talks about ten Feindfahrten of U-559 until Grasser is transferred off and U-559 does not return from her next patrol. Grasser was transferred to U-537 as Chief Engineer and was aboard that boat when they placed a remote weather reporting station on the shores of Newfoundland. U-537 was lost with Grasser and the entire crew just weeks before the end of the war. 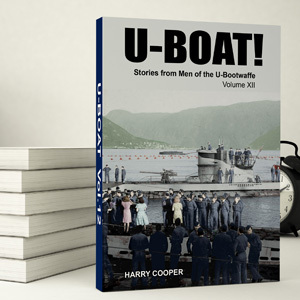 Chapter 12, ‘Saga of the Captain of U-81 and U-513‘ – This is the story of FRIEDERICH GUGGENBERGER (269-1987) from his time at the Academy through his sinking of the aircraft carrier HMS ARK ROYAL through his war patrols with U-81; his transfer to command of U-513 through the loss of that boat and his escape from P.O.W. Camp Papago Park in Arizona. Chapter 13, ‘How the V-2 Could Have Won the War‘ – S.E.I.G. Agent Michael Ivinheim is an excellent researcher, and goes deeply into the new developments of the German rocket programs that put Germany within six months of being able to cities on the American east coast; some think three to four months is a better guess. This chapter goes into detail how this unfolded and it is information we had not seen before. Chapter 14, ‘An American Soldier in an Eisenhower Starvation Camp‘ – Memories of a U.S. Army soldier who was a guard at one of these terrible camps and he tells of the horrible conditions and some of the atrocities committed by other guards – under orders to starve the German prisoners literally, to death. The descriptions are real and lifelike – and one cannot help but be terribly saddened. Chapter 15, ‘More Secrets of U-234′ – We are well aware that U-234 was headed for Japan with a cargo of scientists, two Me 262 jet fighters in crates with data for the Japanese to go into production of them, modern acoustic torpedoes and 560 kilos of uranium for the Japanese atom bomb project. This chapter by S.E.I.G. Agent Michael Ivinheim goes far deeper into this riddle and talks about the Third Reich scientists that also went to Argentina. There is a great deal of previously unknown factual data in this chapter and Ivinhein goes deeply into detail. He worked closely with WOLFGANG HIRSCHFELD (34-1984), Chief Radio Petty Officer of U-234 on these revelations. 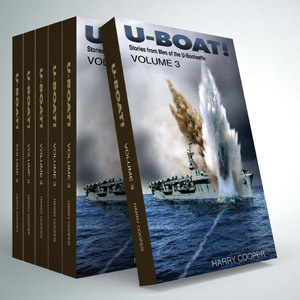 Chapter 16, ‘U-Boat Operations at Curacao and Aruba’ – This covers the day to day operations and attacks by the boats in this area including U-502, U-161, U-156, U-67, U-129 and others. This is great in-depth detail for the purist who wants to know exactly who was doing what, on what days and in which area. We also dispel the official report of the ‘barrel premature‘ aboard U-156 in which the gun exploded, killing the gunner and severely injuring the gunnery officer, DIETRICH ALFRED von dem BORNE (38-1984). Chapter 17, ‘Aboard the GRAYLING’ – Ed Campbell tells of his time in the U.S. Navy from his training as a ‘90 day wonder‘ to his training aboard cruisers then into the submarines where he rode USS GRAYLING and he tells of the battle action there. Ed was fortunate and was transferred off GRAYLING before she set off on her final patrol from which she did not return. He then rode various boats including USS CABRILLA and later USS TIRANTE under Skipper GEORGE STREET (2448-1992) and XO ‘NED‘ BEACH (1163-1989). Chapter 18, ‘USS QUEENFISH vs. AWA MARU’ – Did this American submarine sink a hospital ship as some claim? Was the American Skipper punished? Why was notice of AWU MARU sent in the clear with no codes? Why didn’t the American Skipper receive it? This complete story is told by CHARLES LEVINE (2969-1993), the radioman aboard USS QUEENFISH. This is accurate history from a man who was there. Chapter 19, ‘Last Patrol of U-3030′ – WERNER KREYMANN (1907-1991) translated and sent this piece from Horst Winkelsdorf. They were both crewmen aboard this Type XXI boat that was trying to stay alive in the closing days of the war. In addition to life aboard, he tells of the times they tried to help the rescuers in German cities and remembers so many times he would try to pull a man out of the rubble by his arm – only to have just an arm and no body; or just a head with no body. The bombing raids were terrible, but so was their attempt to save themselves and their boat. They watched other U-Boats and surface ships blown to bits in unopposed air raids in late April and early May of 1945. They were sitting on the bottom for days and did not even know the war was over. Did they escape? It is all in this chapter. Chapter 20, ‘The Type IX-C U-Boat’ – Captain ROBERT THEW (333-1987) was Naval Intelligence for his time in the U.S. Navy and after discharge, he worked at the NSA for years. His father was Skipper of the old submarine USS NAUTILUSand designed the Twin Dolphins used by U.S. Navy submariners even today. He goes into great detail on why the need for a long-range submarine then into the design, the flaws and the building of this Type. This is an excellent chapter for the technically interested. Your copy will be hand signed by the author. The book consists of 220 pages with 200 photographs.